We all remember the summer holidays that seemed to last forever; the uncertainty of what lies around the corner after months of freedom from school and normal childhood, or adolescent, routine. The Way Way Back captures the summer vacation in a more depressing way, demonstrating the strain placed upon family life when you are suddenly forced to spend the majority of your time together. That seems to be what The Way Way Back is really about. Duncan’s family is broken. From the first lines of the film we understand that Duncan is dealing with his own low self-esteem and social awkwardness whilst trying to cope with his Mother’s new, condescending boyfriend and his bratty daughter. Duncan is a boy searching for a father figure and when the adults of the film choose to treat their vacation like Spring break – getting stoned, drunk and frisky – it is up to him to make friends, explore and ultimately find some form of happiness to get him through the vacation. The ‘alternative family’ seems to be a reoccurring theme in films I have watched in recent cinema trips. Along with What Maisie Knew, The Way Way Back also points out the importance of finding family, in any way we can. Actress Toni Collette has a vast amount of experience when it comes to fitting into cinematic families. Her character, Pam, is damaged. She is lacking in self-confidence which ultimately causes her to make bad decisions. These decisions, seeming pathetic and sad at first, become selfish and neglectful through the eyes of her motherhood. Collette gives a typically believable performance, breaking her characters troubles down for the audience as the film progresses. As a mother, a lover and an individual – she is confused and lost. It is her transformation and development that forms a second story in The Way Way Back; a story as equally intriguing as the main one. Steve Carell gives a commendable performance as “the evil step-father” who we initially believe to be misunderstood and irritating but who becomes malicious, manipulative and sly. The performances hold up this film, making the storyline believable and bringing the initially dull characters to life. Allison Janney and AnnaSophia Robb are both superb in their supporting roles. It is at a water-park that Duncan finds refuge. Owen, the zany manager, played magnificently by Sam Rockwell, becomes a friend and then a father figure. Their relationship is based on their ability to understand one another. Never speaking down to Duncan, Owen remains a companion and a pillar of trust. Yet, Owen has his own problems and by scratching at the surface of these issues, the audience are given a glimpse into Owen’s personal turmoil, deepening this already substantial plot. Every character is flawed and every character makes mistakes; it is this messages that remains consistent throughout the entire film. Duncan, reminding me a lot of my own youngest brother, was endearing to me and I found myself becoming more and more attached to him, desperate for him to find his place and to grow in confidence. The Way Way Back was a very pleasant surprise. Despite several cheesy moments, I associated entirely with the film. Maybe this blinds my true view of the film but having just moved to a new city, living away from those I love and having to depend entirely upon myself, The Way Way Back was the perfect choice of film to watch in my first week alone. Despite my fears and worries about this year in a new city, I left the cinema wiping away tears and beaming from ear to ear with the film’s overall message ringing in my mind – There is a whole world out there, waiting. Do not settle. 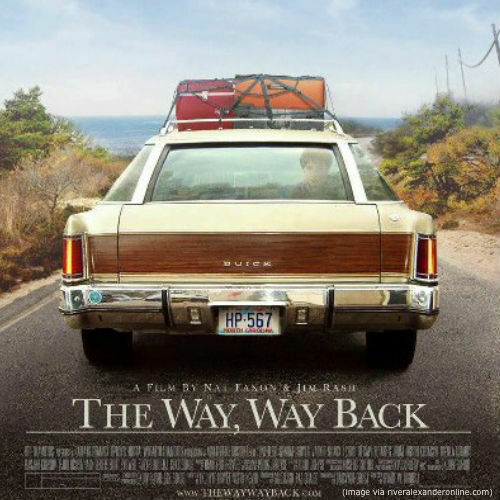 Tags: Allison Janney, American Film, Cinema, comedy, Drama, Family, film, Film Review, Movie, Sam Rockwell, Steve Carell, Summer, The Way Way Back, Toni Collette. Bookmark the permalink. Previous post ← Upstream Colour.